Posted by Charmaine at 10:13 a.m.
July 20, 2009 at 1:21 p.m. This is amazing. I love his little eyes. They are perfect and your painting job is just amazing. Beautiful, just beautiful. July 20, 2009 at 2:16 p.m.
OMG! That cake is the epitome of cuteness! Well done... I am in awe! July 20, 2009 at 2:24 p.m. This is adorable. Even better, adorable and edible. You have quite a talent for capturing spirit in all of the cakes I've seen so far on your site. 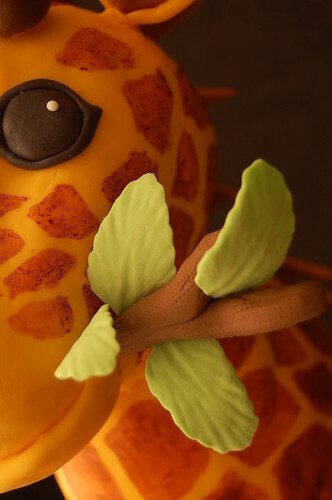 Is it appropriate for an adult to ask for a giraffe cake for her birthday? Anyway, I found you through TasteSpotting and am writing to invite you to visit my new site (below), which is devoted to publishing photos that are rejected from TS and FG. It’s a lot of fun! I hope you will swing by and look around. July 20, 2009 at 2:33 p.m. This is so adorable! I'm in awe of your skill! July 20, 2009 at 2:40 p.m.
July 20, 2009 at 2:57 p.m. I just found your blog via Foodgawker, and that giraffe is enough to make me gawk! Stupendous! How excited are you that you created that! July 20, 2009 at 5:09 p.m.
July 20, 2009 at 5:59 p.m.
July 20, 2009 at 6:24 p.m.
WOW. Just...WOW. You are amazingly talented! July 20, 2009 at 6:38 p.m.
July 21, 2009 at 2:19 p.m.
Just found your blog & looking forward to learning more about your journey from MD to Pastry Chef. Makes me wish I had more time to pursue my creative side! July 22, 2009 at 5:41 a.m.
wow wow wow - your talent is unreal. 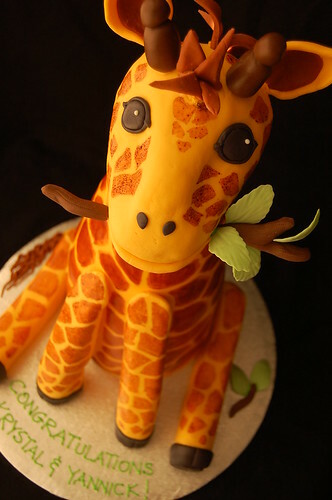 i would never eat that giraffe cake if it was given to me. i would just save it forever! you are truly inspiring! July 22, 2009 at 11:42 a.m.
July 23, 2009 at 3:12 a.m.
July 24, 2009 at 7:50 a.m.
Can I ask a question? I have just started making cakes and working with fondant. I want to make my daughter's first birthday cake so I had to jump right into the fondant and what not, since my focus has been on the decoration I haven't spent much time on the cake itself. I've just been using boxed mixes so that I could get right to the decorating. I've watched the cake shows on tv and the cakes seem much more dense which I think would help with the sculpted cakes. Cakes I've had a weddings are also much more dense than a cake mix. Can you provide any insight on this, I really want to do a sculpted cake and would appreciate any help. July 24, 2009 at 8:53 a.m.
Omg that is the cutest cake ever. You are so talented. This is probably your best work yet! July 24, 2009 at 7:04 p.m.
Caylen: Thanks! Yes, I do use home made fondant. For the ears and branches, I used my fondant with a little tylose powder kneaded in (will dry harder, like gumpaste). They were all shaped about 5 days ahead of time (to allow for drying) with toothpicks inserted. Then during the final assembly, the toothpicks were inserted into the giraffe's head and secured with royal icing, if needed. Drvance19: Instead of using box mixes, I would recommend that you find some good basic recipes for cake with enough structure to allow for stacking and sculpting. Also remember that as you build upwards, past 3.5 to 4" height, you need to divide the height into tiers using supportive cake boards and dowels. Personally, I bake sheet cake which I then cut out to make the appropriate sized layers rather than baking a cake in a pan and then slicing layers. It's simply how I've been trained but I am certain that everyone has their own preferred techniques. Good luck! July 24, 2009 at 10:54 p.m.
what a welcome greets us as we enter your pastry world. E mentioned that we should view when we had the chance and it was definitely worth it! July 26, 2009 at 7:25 p.m.
August 1, 2009 at 3:43 p.m.
August 1, 2009 at 11:51 p.m.
August 7, 2009 at 4:22 p.m.
August 10, 2009 at 2:02 p.m.
Uhm...You're definitely making me JEALOUS!!! I wish I have the artful fingers and hands like yours!!!! August 13, 2009 at 2:17 p.m.
this cake is amazing - you've definitely found your niche! August 22, 2009 at 12:16 p.m.
WHY do you have to live in CANADA??? 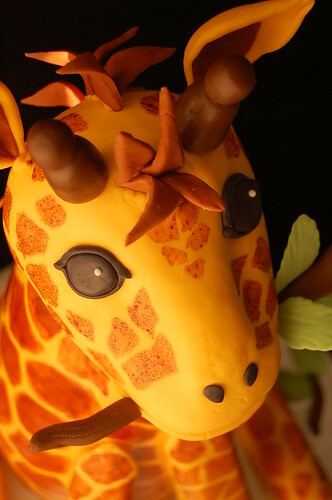 I NEED to have that giraffe cake for a friend of mine. Do you think you could take a vacation to Maryland and make one for her??? April 19, 2010 at 8:45 a.m. This is fantastic. 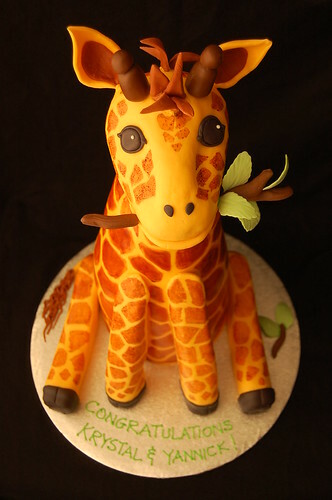 My husband makes cakes so I had to show this to him since I love giraffes. We have used different candies on top to make different things, but never though to cover them with icing to be part of the 'cake'. We have always just carved out the cake to the shape we wanted. Thanks for the idea with the rice krispie treats!! June 8, 2010 at 3:49 p.m.
How did you anchor the head onto the body? Absolutely love this cake! April 19, 2013 at 9:53 a.m.